I think I need surgery to remove the memory of Martin Caidin’s Exit Earth before I can read these. Even after googling I’m not much the wiser, I’m afraid … same general plot, I gather, but was it particularly bad or particularly good? Hasn’t Baxter’s management of plot threads over series been something of an issue for a while though? So I’m not sure why it would be an issue for you this time out? Time’s Tapestry was just a series of things happening which just about worked but which failed (on a structural level) to strike any deeper historical notes. Destiny’s Children was three barely related novels, one of which was a throwback to an earlier series, held together by an incredibly loose philosophical thread. The Manifold series riffed on a similar cast of characters and a similar set of SFnal props but was largely lacking in inter-relation too. 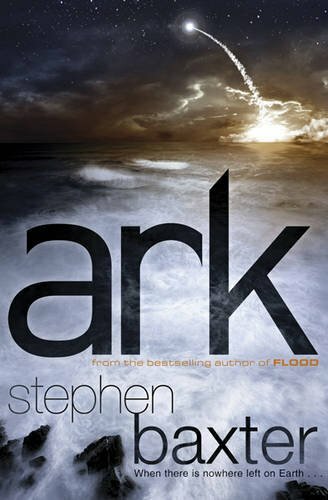 Is it just that Ark makes (in the opening act and at the end) a more concerted effort to service some wider narrative? The stuff with the murder mystery at the beginning is certainly clunky. So clunky in fact that I essentially treated Ark as a standalone novel, which possibly explains why I didn’t react as badly as you did to a) Baxter’s attempts at continuity and b) his weirdly fragmented ending that seemed all about setting up venues for future short stories and novellas. The Caidin had so many faults that I’m sure the Baxter can’t share all or even many of them, but the one that worries me is the author’s weighting of the scales to make sure that of all possible responses to the crisis the only one that has a chance of working is the protagonists’ glorious adventure in space. Jonathan: the lack of inter-relation in the earlier series worked just fine for me. They had a broad background concept — multiverse; Xeelee saga; history of the British isles — and set stories within that. Manifold and Time’s Tapestry concluded with attempts to tie the series together, for my money successfully in the latter but not in the former; Destiny’s Children just went for thematic coherence. What I was trying to say about Ark is that I think it falls between the two stools. I expected, partly on the basis of reviews from people who hadn’t read Flood, that it would be more or less in the Destiny’s Children mould; what I got wasn’t that, but it wasn’t a successful completion like Weaver either. In principle, I even quite like the idea of the fragmenting ending, different threads of humanity spreading out to different destinies … but there again I think the problem is structural, because as you say, at the moment it just ends up feeling like a set-up for spin-offs. I thought this was an unusually weak entry in Baxter’s oeuvre. It had such close parallels to TITAN, as you observe, and indeed to MOONSEED that it felt at times like a watered-down parody of those works (pun intended). You have the planetary disaster, you have the big engineering project… Baxter has done all this before, and better. The scenes set aboard Ark One felt especially self-derivative, with Baxter’s theme of accelerated evolution in space making a de rigueur appearance, and even a nod to his old motif of “save the breeders,” in the instant when Holle chooses to save a mother instead of her baby. ARK’s treatment of the evolution theme is nowhere near as good as the novella in his “Destiny’s Children” collection — I forget the title; the one about the generation ship that spans centuries; and the breeder-pragmatism that was so relentlessly extrapolated in COALESCENT felt out of place here. Can you tell I was disappointed by this book? Stephen Baxter is my favorite hard SF writer, bar none, and I’ve come to expect great things from him. I hope he returns to form with his next outing. Mayflower II. Really excellent, that, I agree.